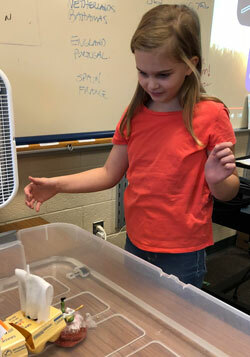 Students in Tony Molnar’s STEM classes at Pine Island Elementary came across some rough waters in their classroom. 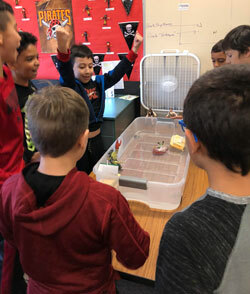 As part of the second year of using the Flite Test STEM curriculum in Comstock Park Public Schools, Molnar decided to use a pirate theme crafting ships for boat races, following the same format as paper airplane races they did the previous year. 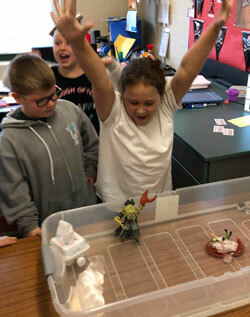 Using donated items like egg cartons, notecards and hot glue, more than 80 student groups among 15 classes constructed their boats and competed for the vessels to win in races. 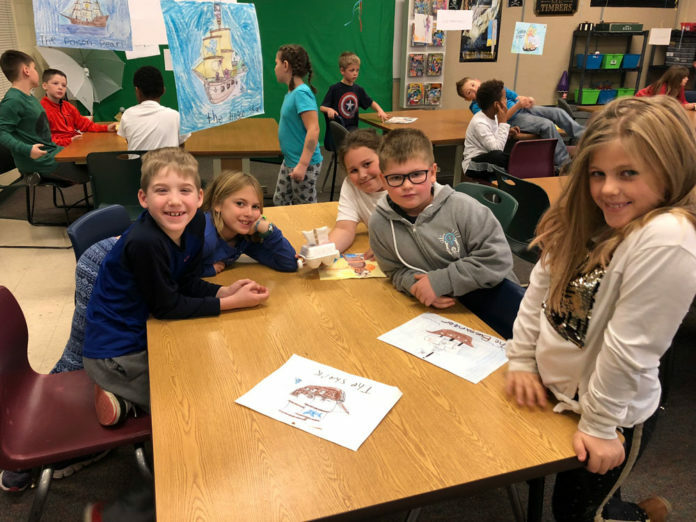 Students learned what kind of sail was best for speed, what shape floated and what materials were best suited for the competition by working as a team and testing out boats before the race. The actual race took place in plastic tubs filled with water and obstacles that the boats had to navigate around. A fan behind the tub propelled the boats forward in most cases. Making mistakes is also part of the fun. Third-grader Skylar Dewild’s favorite part was devising a plan for her boat and considering how it would best race. On the course for the homemade boats, Molnar often places obstacles, like marooned pirates and evil creatures, which students have to avoid. Racing pirate ships touches on several components of the STEM curriculum, Molnar said. 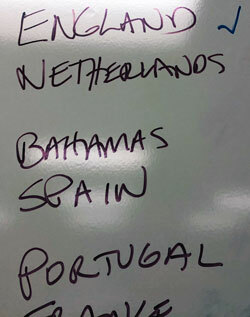 Each student was able to name their ship and create a flag to fly during competition. Each year, Molnar’s program receives a $250 grant for supplies, most of which goes to purchasing building materials for the next year. In addition to hands-on building projects, Molnar’s class has a strong emphasis on digital elements utilizing Ipads, a green screen and some excited kids.